2011- Handy Manny is set in the fictional town of Sheetrock Hills; a play on the genericized trademark for drywall in the United States; where the titular character, Manny, owns a repair shop along with his anthropomorphic talking tools. It is unknown exactly where this town is located, but due to the multitude of Spanish speakers and town's location being in a desert, it may be Arizona. Most 30-minute episodes contain two stories. They typically begin with Manny and the tools interacting in Manny's repair shop. While there, someone, usually needing something repaired or assembled, calls Manny, who answers, "Hola, Handy Manny's repair shop, you break it" and then the tools shout "We fix it". Manny and the Tools sing "Hop up, Jump in" while the Tools hop into his tool box. In most episodes when Manny and the Tools leave for the repair, they see Mr. Lopart and his pet cat Fluffy in front of their candy store. Mr. Lopart would try to do something on his own without any prior experience. Manny offers him to help but Mr. Lopart says that he doesn't need any help, after Manny and the Tools leave the item Mr. Lopart was building would malfunction and cause a mess. Once Manny and the tools arrive at the repair site, they collaborate on the best way to fix the broken item. Manny then goes to Kelly's hardware store where she always has the item that they need. Once they have the item for the repair they go back to the worksite and sing "We Work Together" while performing repair. Handy Manny is a Disney Channel animated children's television program launched in 2006. The program was originally part of the Playhouse Disney daily block intended for preschoolers. On February 14, 2011, it was moved to the Disney Junior block, serving as Playhouse Disney's replacement. The show features the adventures of Manny Garcia, a bilingual Hispanic handyman, and his anthropomorphic tools. It also teaches young children the beginnings of Spanish and the importance of cultural diversity. A bilingual French version premiered June 3, 2009 on Teletoon alongside the original version. Also Wilmer Valederama(sp?) aka Fez from "That 70's Show" does Manny's voice. 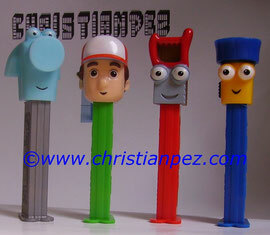 The 4 characters are Handy Manny Garcia, Dusty the Hand Saw, Pat the Hammer and Flicker the Flashlight.